"You never ask about my past." This is the second and final disc in the Rurouni Kenshin (roughly translated as "Wandering Swordsman Kenshin") four OVA set. Nobuhiro Watsuki's story is inspired by characters and historical events during Japan's Tokugawa Period (which I covered in the first disc's review), though the story itself is fictional. In the TV series that these OVAs act as prequel to, Kenshin has given up his past life as a hitokiri (shadow assassin), instead looking for ways to atone for his sins. With these final two episodes in the OVA, we learn why this transition has taken place, and how he gained his trademark scar. As episode three opens, Kenshin (Mayo Suzukaze) and Tomoe (Junko Inao) are in exile on a farm in rural Japan not far from Kyoto (Edo), living under false pretenses as man and wife. Their only contact with the outside world is Iizuka (Ryusei Nakao), coordinator of the assassin squads, who brings word that the Shogunite is hunting the countryside for the rebels looking to overthrow the government, and even his own Choshu clan, trying to save face with Tukogawa, is encouraging its radicals to commit suicide. Kenshin is given a cover as a medicinal supplies salesman, so he and Tomoe begin planting crops, settling into a more peaceful lifestyle. However, as time passes, Tomoe finally opens up to Kenshin some of the details of her past, which she has been journaling while he sleeps. Despite her openness, she still holds some dark secrets that are brought to the surface when her little brother, Ishusi (Nozumu Sasaki), appears. AS the truths of betrayal begin to be exposed, the newly-found happiness Tomoe and Kenshin have discovered may be but a brief reprieve in their ultimate destinies. As with the first two episodes, the animation quality is amazing, with detailed and often photorealistic backgrounds, which really add to the tone of the show. The pace, however is quite different on the final two installments, with very little action occurring until the series climax. However, the time spent with the characters certainly enhances our understanding and sympathy for their various internal conflicts. Several segments flash back to the previous episodes, and in many cases the viewer has to wonder exactly what is being revealed to whom. In the end, we have a wonderful story, which, while tragic, makes for a very worthwhile experience. Image Transfer Review: Video quality is exceptional, with only a few minor instances of aliasing here and there. The beautiful backgrounds are well presented with deep and vibrant colors, and the many night scenes are also solid in their black levels. The many seasons presented in these episodes are amazing in their detail. Audio Transfer Review: Both the original Japanese track and English dub are presented in stereo.Directionality and sound design are well presented. The feature can be viewed with or without English subtitles in both languages. Due to significant differences in the English dub script, I highly recommend the original language track. Extras Review: Like the first disc in the set, each episode is chapter-marked by opening and closing credits, plus acts one and two. Credits for both the Japanese and English voice talent roll over the end credits. Samurai X (Rurouni Kenshin): Betrayal features six front-end preview trailers, which can be skipped by pressing either the chapter advance (to move to the next preview) or the menu button to get to the main menu. The quality of these previews exhibits some interlacing, though they are generally pretty good. Included are Bubblegum Crisis 2040, Gasaraki, Ninja Resurrection: Revenge Of The Jubei, Neon Genesis Evangelion, Blue Seed and the ADV mix trailer. Unlike disc one, this time the included insert card correctly lists the titles. There are character profiles that also include optional clips from the two episodes on this disc showing the characters. In addition, a screenwriter's notes section on adapting the story for the OVAs is included as scrolling text, which I found (like I did with a similar feature on the first disc) I had to pause in order to keep up with all the writing. The Samurai X OVA is the only trailer actually accessable from the menus. As with the first disc, ADV has included a reversable cover for the disc for those upset by the renaming of the series in North America. 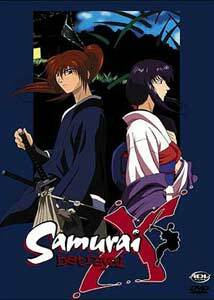 This eliminates the Samurai X designation in favor of the original Rurouni Kenshin title. Though I must commend ADV for offering this option, I do have one minor nitpick about the Rurouni Kenshin side, which is that the logos on the spines don't line up since disc one is missing the catalogue number and DVD logo, which the second one has. Attention to details like this would greatly improve the on-shelf presentation. Having seen the whole series now, I would definitely rate these as a high recommendation. Where the first two episodes concentrate on the action and the underlying political situation, the final pair delve deeper into the characters, allowing us to understand their motivations. The conclusion is satisfying, and the rich animation quality shines on both these discs.